Opened in the 1970s, the Downing University Center (DUC) became the destination for campus community. As students' needs changed, the DUC experienced a decline. As students realized the value of revitalizing this asset, the University engaged Mackey Mitchell, in association with Ross Tarrant, to renovate and expand the DUC creating a vibrant and welcoming hub. The phased $58.3 million project included study, meeting and event, lounge, and student activity spaces. Upgraded dining, new entrances, outdoor spaces, and a new campus store completed the transformation. In recognition of its renewal, the DUC has been renamed the Downing Student Union. By organizing a benchmarking tour with student leaders, MMA helped achieve campus consensus on the project's importance and then led engaging campus workshops to distill an exciting vision for the transformation. This included: Creating “wow-factor" by sighting new entrances to foster an inspiring and welcoming first impression, enhancing connectivity and wayfinding by creating a dramatic terraced atrium bringing daylight deep into the building, and strategically relocating program within the Union to enhance effectiveness, interaction, and visibility. Assisting in renovation logistics, the design team formulated phasing plan keeping DSU open for business while shortening the overall construction period. Considering the impact the revitalized DSU will have in future generations of WKU students, Howard Bailey, Vice President for Student Affairs, stated, "Producing a well-rounded student is paramount at Western Kentucky University. The new Downing Student Union gives us the necessary facility to accomplish our goal." From the big picture down to the details of the visitor experience, the DSU's story is one of transformation in which an under-performing asset is envisioned in new and creative ways. Today every square inch of space in the Downing Student Union tells a story and sings the spirit of Western Kentucky. The design team will often take group benchmarking trips prior to programming. This is a group photo of the participants for this trip. 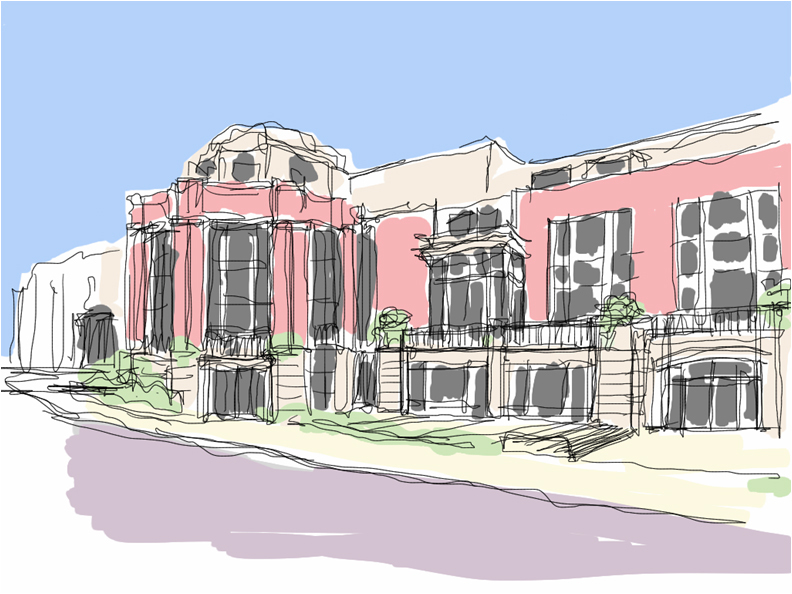 This exterior conceptual sketch begins to imagine the main stair as a significant design element in the project. 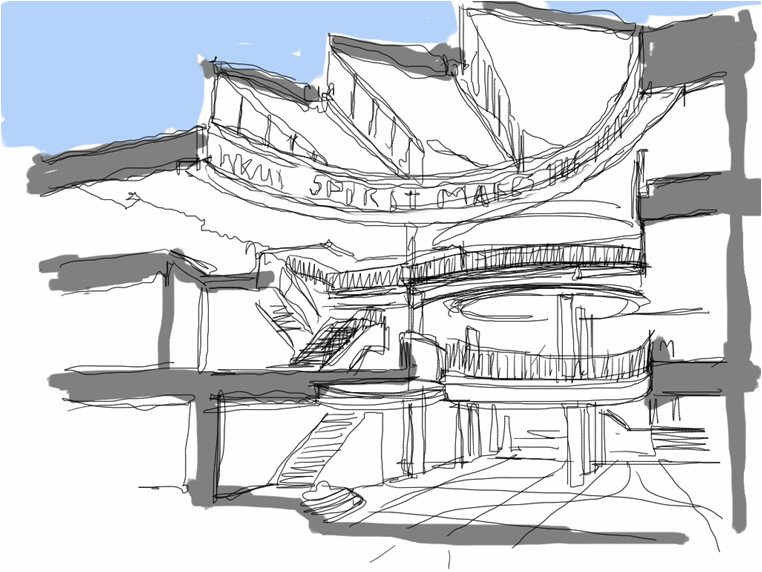 This conceptual sketch of interior atrium shows how the floors are being opened up to allow visual access and connectivity to all parts of the building. 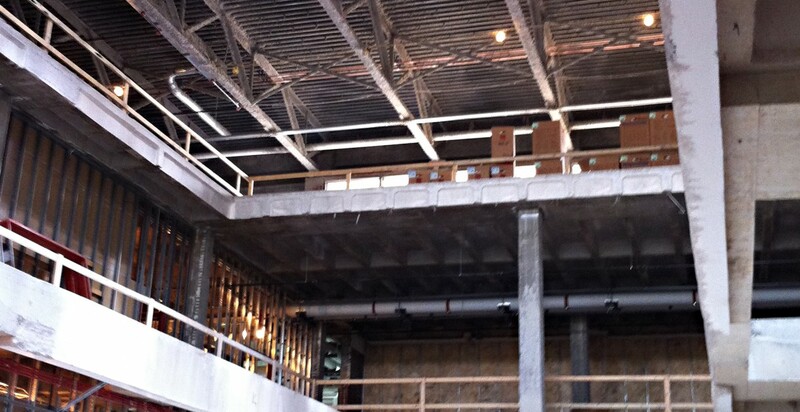 Atrium under construction showing the opening of floors to provide greater visual connectivity. 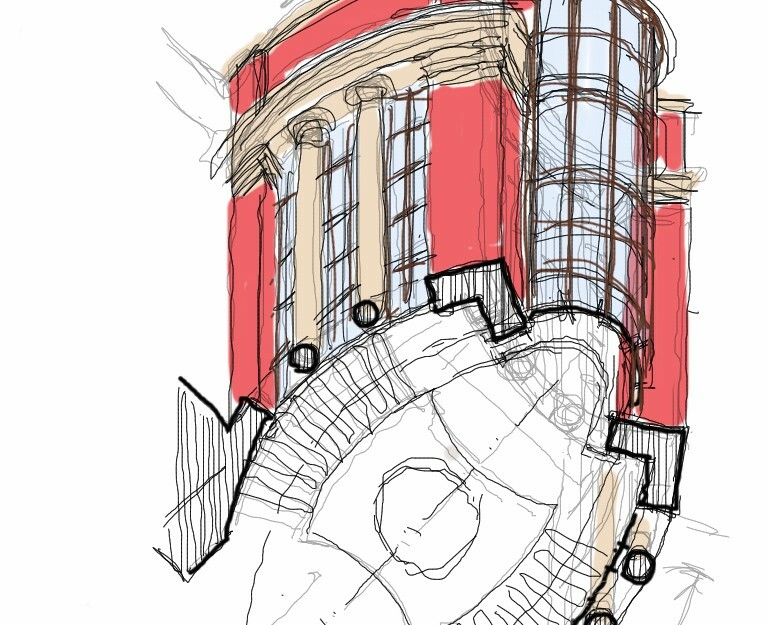 A concept sketch of monumental stair showing the arrangement of the stair treads and the open center. 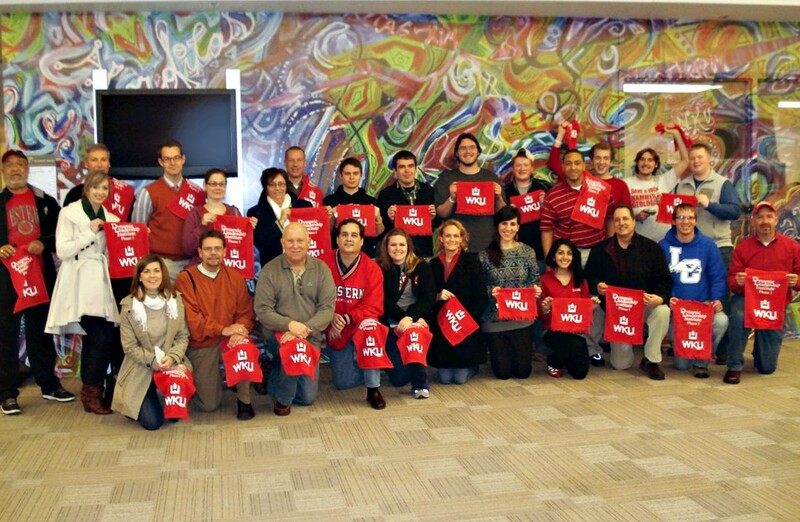 The renovation provides an innovative, sustainable space that benefits the entire WKU community.